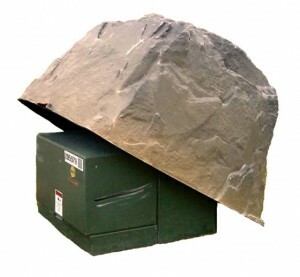 A fake rock could be the perfect solution for protecting an AIMS Power inverter from the elements. If planning on setting up an outdoor power system for deck lighting, for instance, just be sure to put your inverter in a place that won’t be affected by the weather conditions of your area. Try securing it under a fake rock or in a shed. So let’s say you want to power this Brinkmann 6 Piece Low Voltage LED light set and this Hampton Bay 3-Tier Brown Resin Barrel Fountain for 12 hours per day. You have a requirement of 1.6 amps (20 watts) for the lights and .04 amps (2.5 watts) for the fountain. A 400 watt AIMS power inverter for $44.50 will get you more than enough wattage (leaving some room to power other appliances as well if need be) and a 100 amp hour deep-cycle battery will be at nearly 50 percent discharge after 12 hours of pulling 22.5 watts. We don’t recommend discharging the battery further than 50 percent, as it will reduce the lifespan of the product. To recharge your battery, all you’ll need is our 30 amp solar charge controller and four hours of sunlight with one 60 watt solar panel. The battery will be fully charged before midday. You’ll have plenty of time to enjoy your fountain and time to spare before your landscape lighting switches on. EXAMPLE No. 2 — So you want to power four of the six-piece light sets, four of those fountains and you also want to add in a Fire Sense 1,500-Watt Stainless Steel Infrared Electric Patio Heater and this Sony – 700W Stereo System w/ 230 watt amplifier. Let’s say you want to run the lights and fountain for 12 hours per day, and the heater and stereo for two hours per day. You’re looking at a total wattage requirement of about 2,520 watts of maximum continuous output, which means you’ll need at least a 3,000 watt power inverter or a 3,600 watt inverter if you feel you might add a few things later. As for your battery bank, you’ll need five 200 amp hour batteries to tackle those electrical requirements. ***Remember*** this rating assumes you only discharge the battery bank to 50 percent life. To recharge the battery bank for this example, it will take a 40 amp solar charge controller, eight 120 watt panels and about six hours to get the bank back to full charge. 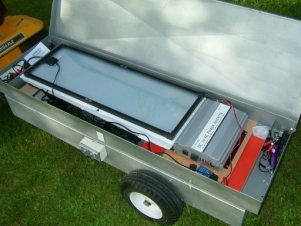 This entry was posted in Inverters, Solar Power and tagged AIMS Power, DC to AC Inverter, deck lighting, Dennis Evers, fountain, Green Energy, Inverter, landscaping, lighting, Mobile Power, Off grid, off-the-grid, outdoor power, portable power, Power Inverter, Renewable Energy, solar charge controller, Solar Panels, Solar Power, yard work by Eric Lee Castillo. Bookmark the permalink.